Medieval Knight Warrior Short Sword With Scabbard | BUDK.com - Knives & Swords At The Lowest Prices! 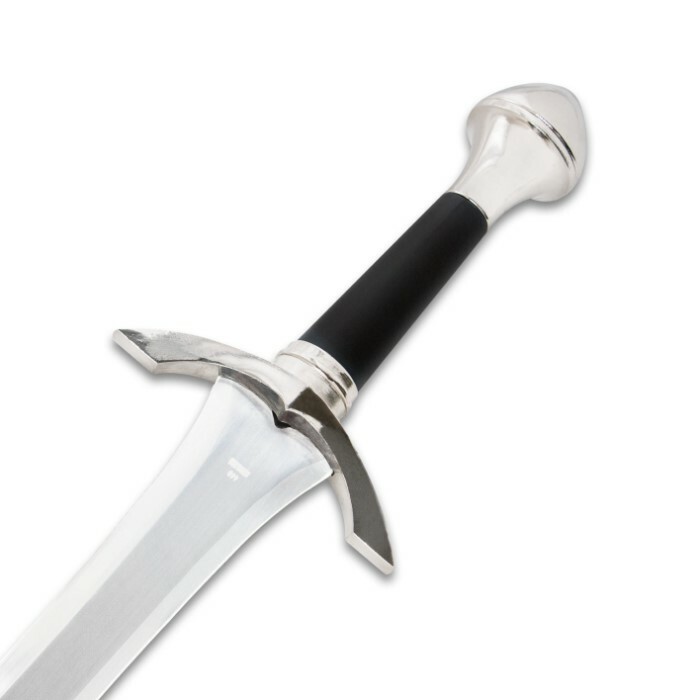 This Medieval Knight Warrior Short Sword features a 22 3/4" blade of 440 stainless steel with a gleaming, high-polish finish. The double-edged blade culminates in a piercing point and features a decorative hand guard and pommel and a black grip. A coordinating scabbard is included to house the blade. 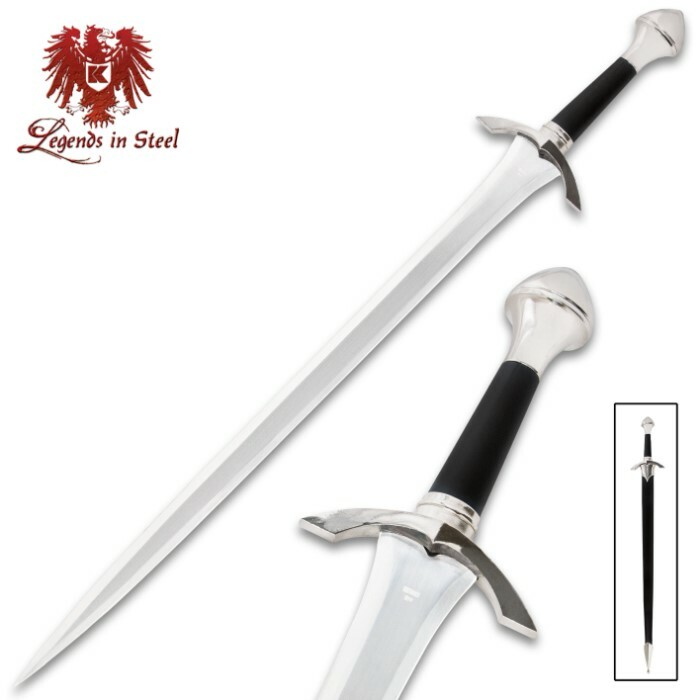 This short sword makes a great companion weapon to your Medieval long sword. For the price, this is a really nice sword. It's sturdy, sleek, and good quality. For anyone looking to attach it to a belt, look for a sword frog! I have a frog that is black leather with silver studs and it looks fantastic in tandem with this sword. It's a short sword. Know that before you buy and don't expect a Glamdring sized blade. It came sharpened (be that good or bad is up to you). The pommel is only screwed on, so be gentle with it. The scabbard has NO WAY to be affixed to a belt- be advised. (It actually looks a bit like Glamdring now that I think about it). All in all, a great blade for the serious collector, or if you, like me, just like to carry a sword around the house every day. I have this sword and antiqued it and the scabbard for a wall decoration. Also, if you watch Fellowship of the Ring, it looks quite a bit like one of the blades that Strider gives to the hobbits at Weathertop. Beautiful sword for a first buy. Very shiny and sturdy (even though it's not full tang). i'd say this isn't the sword for you if you want to do actual combat (maybe you could do light and very careful stage combat). 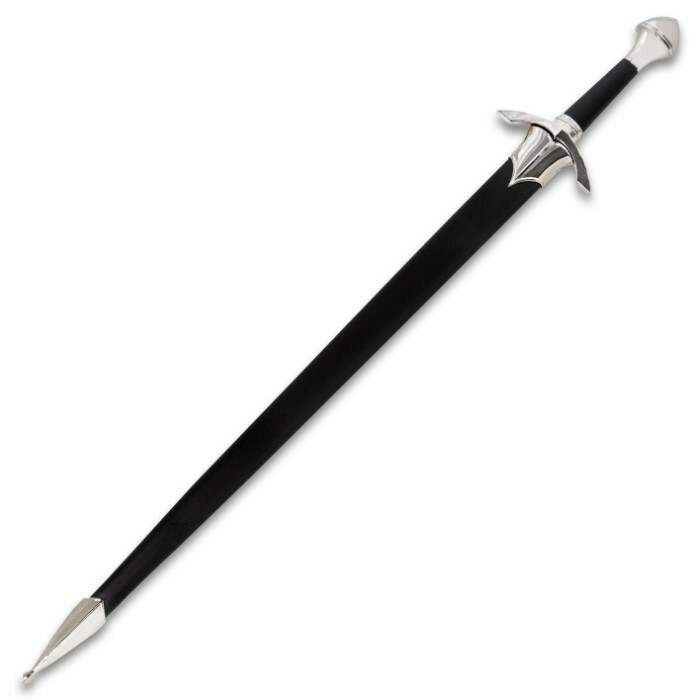 But anyways, great sword, great price, and it is a great decorative/ light stage combat piece. Also there's no easy way to connect it to a belt, but I just knotted a second belt in a certain fashion and tied that belt to my actual belt and it worked great! However beware, the tip of the sword comes very pointy. May want to dull it down so you don't actually stab yourself or someone else. It's about the length I expected but it's not a wide as I expected the widest part is about 1.5 and it's got a sharp taper. The handle also tapers. I took it apart and the tang is tack welded, but still pretty solid. Overall it's a beautiful piece at a great price. An amazing sword! It's solidly built and beautifully made. My only regret is the fact that there is no sure way to attach it to a belt, but simply tucking into a belt works fine! Great sword. It's very sturdy. The only thing that disappointed me was the overall size. I was expecting it to be a little longer. Absolutely beautiful sword. Looks so much better when your holding it in your hands. It is however a bit smaller than you would expect. Be careful the point is pretty sharp. I had a little bit of trouble with the shipping, it got bent pretty bad. But True Sword's amazing customer service it was cleared up really fast. Overall I love the sword I'd recommend it to anyone who is a fan of the Medieval Era or to any sword collector. I just got this piece a few days ago and I immediately fell in love with it. It was a little smaller than expected, but well weighted. I was surprised to see that it came sharp, so I would have to be careful using this for stage combat practice. It's very sturdy, and has metal sheath, which I prefer to the faux-leather ones anyway. This is an excellent buy for any and all!